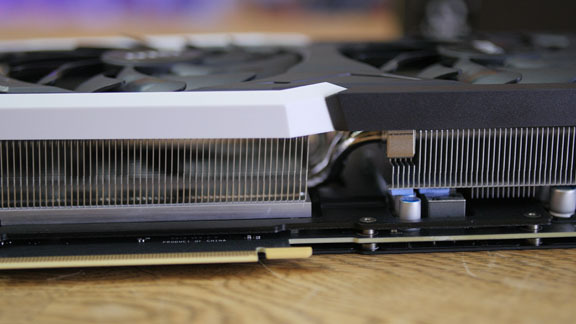 Today, we will be taking a look at yet another graphics card from the RTX 20xx series. 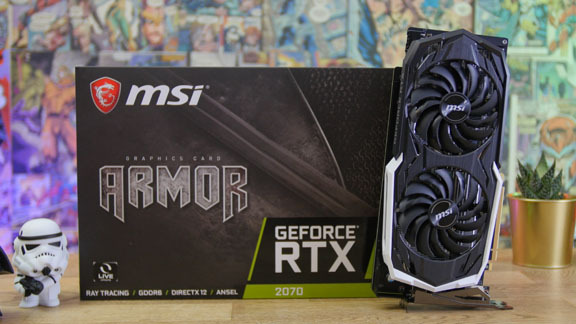 The MSI RTX 2070 Armor, which seeks to provide equal performance, but at an affordable price. 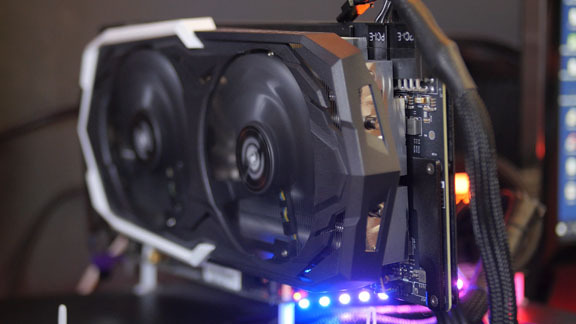 So, we hooked up the MSI RTX 2070 Armor to our test bench, and set out to explore if money saved also meant a compromise in performance. 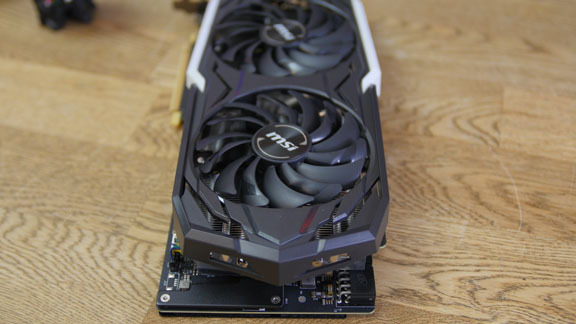 Read our walkthrough of the MSI RTX 2070 Armor graphics card below. 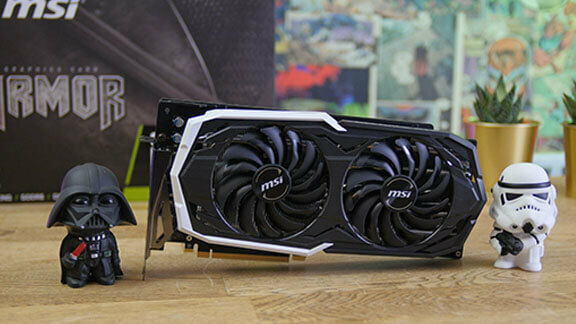 Remember to also check out our review of the MSI GeForce RTX 2080 Ti Gaming X Trio. On the technical side, the MSI RTX 2070 Armor isn’t all that different. It’s still built on Nvidia’s Turing architecture, specifically, the RTX 2070 TU106 chip. As such, the RTX 2070 features a whopping 2304 CUDA cores, 288 Tensor cores and 36 RT, or Ray Tracing, cores. In addition, we get a total of 8 GB GDDR6 RAM on a 256-bit memory bus, which equals that of the larger RTX 2080. Nvidia’s reference specifications puts the RTX 2070 at a base clock of 1410 MHz and a boost clock of 1620 MHz. The Armor version from MSI, however, has an increased boost clock of 1740 MHz, which puts it a bit above average. As a side note, the previously reviewed RTX 2070 Gaming Z card features a boost clock of 1830 MHz, so, with the Armor, we find ourselves situated a bit lower. It’s also important to mention that the 2070 models do not support SLI. 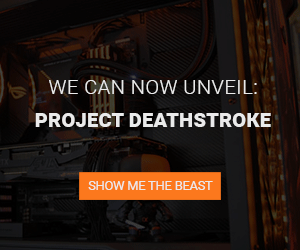 So, if that’s your poison, you are left only with the RTX 2080 and above. From an aesthetical point of view, the MSI RTX 2070 Armor stands out a bit with a more subtle and reluctant design. The colors are kept black and white, with a bit of highlighted silver lettering and logo going on. There’s only RGB LEDs in the logo on the front-facing side of the MSI RTX 2070 Armor, which can be controlled via MSI’s Mystic Light software. 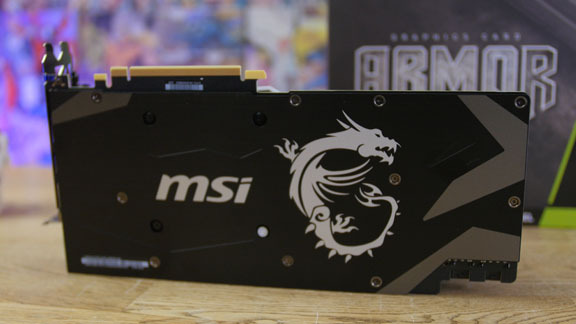 As mentioned, the MSI RTX 2070 is quite subtle from a design perspective, but it’s still really nice to see that we get a backplate in brushed aluminum and featuring the manufacturer’s iconic dragon logo. In charge of cooling, we find two of MSI’s Torx 2.0 fan of each 95 mm, designed on the Zero Frozr technology, which essentially just means that they don’t activate at sub-60 °C, in order to keep the noise output at a minimum. The heat sink beneath the fans comprises 5 heat pipes, all of which are flat, and in direct contact with the GPU chip for optimal heat transfer. It’s not the largest of coolers, but it should be sufficient for this card. It’s all in all a relatively slim card that only occupies two expansion slots in your system. 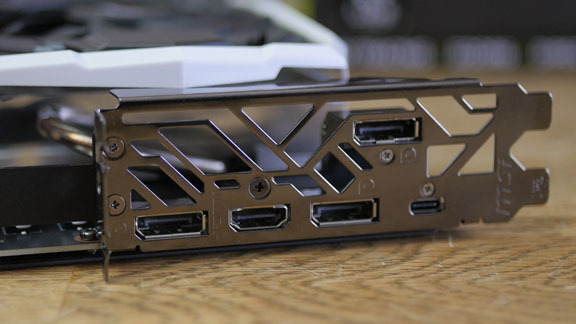 In terms of connection options, we get a total of three DisplayPort connectors, an HDMI connector and a USB Type-C connector, which was added to the RTX series of cards for use with future VR solutions, but which can also simply be used as a regular USB port. 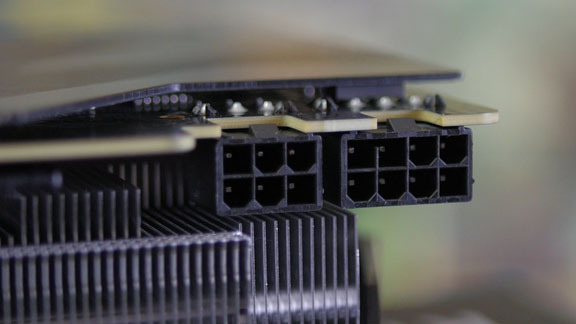 As for power, the MSI RTX 2070 Armor requires an eight-pin and six-pin connector in conjunction. So, with all the technical and physical features of the RTX 2070 Armor covered, we arrive at the part that we’ve all been waiting for; the benchmarks. Under load, the RTX 2070 Armor boosted to about 1830 to 1845 MHz, on average, which is, in actuality, higher than the manufacturer rated speed, and about 100 MHz lower than the Gaming Z card also from MSI. The temperature peaked at around 64 °C, which is quite good. Under load the noise level was also very good. I’m finally able to measure this with our new noise measuring device (depicted below). 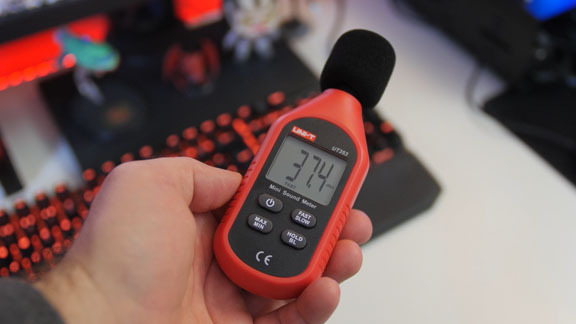 Under normal circumstances, the noise level in the office is around 35 dB(A) during the day. With the RTX 2070 card running at full load, and measured from a distance of 40 cm, the noise level increased to about 37 dBA. As such, the card can be heard in a quiet room, but as soon as you boot up your games, the small amount of noise generated is completed drowned out. Fantastic! In general, I’d say that there isn’t a big gap to the competing graphics cards of this class. As I also mentioned in my review of the RTX 2070 Gaming Z, the performance is quite close to that of the GTX 1080 and 1080 Ti cards, and in some cases, even pretty close to that of the RTX 2080. It should be noted, though, that the comparisons to the RTX 2080 Ti that can be seen in the provided graphs are not completely fair as they seem to suggest that the high-end card performs relatively poorly compared to the lower tier cards. The is largely due to the fact that the RTX 2080 Ti cards are so powerful that they bottleneck at the lower resolutions that I’ve used for this test. The RTX 2080 Ti cards excel at ultra wide and 4K gaming, and at these resolutions, a much larger gap will be seen. In order to get an accurate impression, the price must be factored in as well. The RTX 2070 Armor is, at the time of this writing, priced at around $645, which is about $75 less than the Gaming Z version also from MSI. An RTX 2080 is priced at around $975, which is pretty much the same as a GTX 1080 Ti, if you would happen to be able to source one out. So, there’s quite a large gap to be found here, and in my opinion, from a price-performance ratio point of view, it makes the most sense to get the RTX 2070 card. The small amount of extra performance that you get out of the RTX 2080, to me, doesn’t justify the additional $300 cost. The RTX 2070 manages to keep up just fine, and that applies to resolutions of both 1920x1080 and 2560x1440, and even on higher refresh rate monitors. If you are in the market for an RTX 2070 graphics card, then I’d recommend, based on price-performance ratio, the Armor over the Gaming Z version. That’s a saving of around $75 with a next to nothing loss in performance. 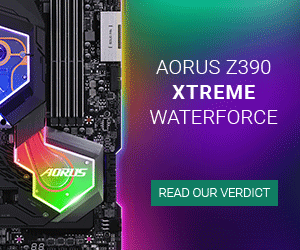 Should the desire to burn those extra $75 finally get the better of you, then it should be for purely aesthetic reasons, in which case the Gaming Z clearly takes the prize, combined with its really nice build quality. As with the Gaming Z, we arrive at a final score of 8 with the Armor. It’s a card that offers solid performance at an affordable price, but also at the price of aesthetics. In the end, it really comes down to taste. The card is really quiet under load, which is something that most gamers will appreciate.